In a general sense, dendrites are solidified crystals with a directional, multi-branching, tree-like structure (Figures 1 and 2). Upon solidification of the melt, the first section to form is the so-named stem. From the stem, small branching arms grow into the melt and the interdendritic spaces. The dendrite level formed first contains less alloy elements than the subsequently growing dendrite arms and the solidified melt in the residual solidification fields (interdendritic space). Dendrites comprise stems and branches or arms; the diameter and distance of these dendrite branches or arms is referred to as dendrite arm thickness and dendrite arm spacing (DAS). Depending on the level of growth, definition of dendritic crystals differentiates between primary, secondary, and tertiary arms. In many casting alloys and particularly aluminum alloys, the secondary dendrite arm spacing (SDAS) exhibits clear correlation between the solidification speed and the material strength (SDAS ~ tsolidification ~ 1/Rm). During continued progress of cooling of the melt, these structures extend further until they tough each other and the melt is completely solidified. At the end of the process, crystals with fir tree structures are obtained. Differentiation is made between directed, oriented, and undirected dendrites. The respective form of formation and orientation within the solidification structure depends on the cooling conditions (conditions of heat transport). With great wall thicknesses, the length of dendrites may be up to several centimeters and with fast cooling rates, the size of dendrites may within submicroscopic scale. Increasing undercooling will cause less branching and thus smaller dendrites (Fig. 3). 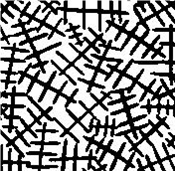 According to F. Chalmers, dendrites only grow in undercooled melts, the directions of growth are always oriented strictly cystallographically, they branch with regular spacing and only small proportions of the melt form the dendrite skeleton. 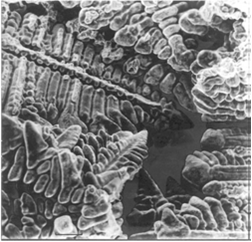 In a metallographic grinding section, dendrites can be made visible by means of etching (s. Etchant). The etching reagent carves out differences in concentration that occur during solidification.